The day after sticking the pork in the fridge to marinate, I also stuck parts of our Kitchen Aid grinder and a stainless steel bowl into the freezer to chill for an hour. 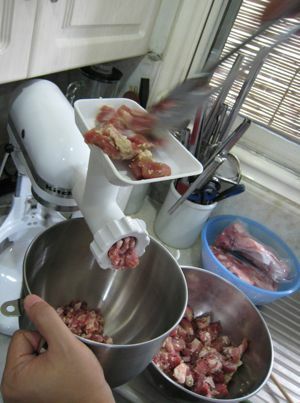 In an airconditioned kitchen, I quickly assembled the grinder with cold parts, took the pork out of the fridge, and used the larger grind attachment to grind through the 3 kilos of meat, which fell into a cold stainless steel bowl. Again, some books recommend you have that bowl sitting in another larger bowl filled with ice, but I just couldn’t be bothered. The meat remained cold, the grind seemed promisingly coarse and meaty and fatty, and I thought it looked well on its way to becoming a nice longganisa filling. 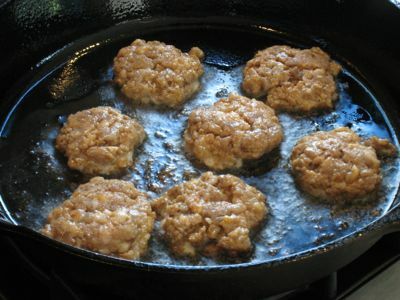 To this ground pork, I added the vinegar, and some ice cold water and mixed it with the paddle attachment of the Kitchen Aid. I then broke this into two portions, leaving one portion as is, and making a second portion with the addition of some paprika for color and a touch (say half a tablespoon) of sugar for sweetness. wicked-looking longganisa! i use a similar recipe, without the chilling part. MM, when i used to do my longganiza in patties, the edges would always be hard, not crisp. sno now, instead of rolling into logs or shaping into patties, i chill the seasoned mixture in a covered container at least overnight. when ready to cook, i simply heat up a frying pan with some oil (just to get the frying started) and fry the mess as is, breaking up the mixture and stirring it around every now and then so that it looks like hash. this way, it cooks evenly, i get it as crisp as my family wants it, and it is easier to scatter everything over the rice (and less wok pa). “Naked” longganisa is a part of my childhood food memories. Mom would make it with (if my recollection is correct) minced garlic, vinegar, brown sugar, a bit of fresh minced oregano and basil, pepper, salt, paprika and some other stuff I don’t quite remember. She would mix this into ground pork (in the market, she would tell the vendor to throw in lots of fat hehe), chill the mixture overnight and cook it the next morning. To form, we scooped it into a teaspoon and grabbed it with another teaspoon before dropping into a hot pan with a bit of oil. Hence, “teaspoon” longganisa. Mom also just fries it in oil with minced garlic and a sah of salt before adding cold rice (cold as in fridge-chilled) to the pan. Instant sinangag heaven! I remember reading the longga efforts of Marvin at Burnt Lumpia some months back, he’s got great posts refitting Pinoy tastes with what ingredients he can find in the US. He’s done a lot of food with ube that one normally wouldn’t think of doing too! I suspect that the earliest longganisas were a cross between the Spanish chorizo and the Chinese lop cheong, with a splash of “native” vinegar to suit the foreign mixture with “indigenous” palates. I don’t remember if my mom ever put vinegar….but I remember that the meat was frozen for easy cutting and we had a manual grinder that was clamped and screwed to the table. I remember this because I took many turns on the handle. good old days. it might have taken a few days to make….the casing having to be washed with papaya leaves if my memory serves me right; leaving them to dry and all sausages gone in a few days of breakfast. 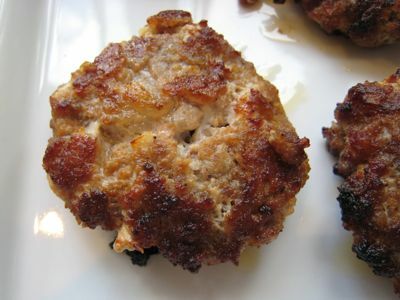 it looks like mini-burger-patties! :) it sounds intimidating to do, but i’m sure i can find the strength in me and try this one sometime, i’ll keep this recipe handy! thanks MM! I’ve always wondered which is more correct: “Longganisa” or “Langgonisa”… I’ve heard different people say either. I also wonder if this is derived from a Filipinized Spanish version of a sausage made in Langogne, France…which would make the term “Langgonisa” more accurate. Naked longganisa! I love this… :) Your blog is very informative. When I was looking where to buy ingredients for Tiramisu, I landed in your website and got all the information. You’re truly a market man! As a kid, I only liked longganisa when it was “hubad,” so this brings back memories. I don’t think I’ve had longganisang hubad in many years, though. Wow! Thanks so much for mentioning my blog post MM! I’ve always been a big fan of yours, so your endorsement means a lot. The chilling aspect of your longganisa making is the evolutionary part. I recall vividly at the wet market then – before manufacturers processed longganisa it was leftover meat of the day that was not sold. 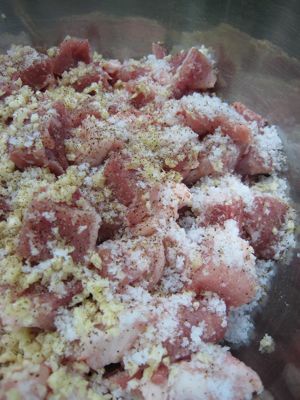 Some scrupulous meat vendors used carabeef in their longganisa mix to have that meaty meat effect and used a lot of saltpeter as preservatives and then prague powder came in the picture of longganisa making. Garlic and ground pepper are the magic wands in longganisa whatever longganisa version youâ€™re looking at either from Ilocos, Pampanga or Lucban garlic and pepper is the common denominator. Longganisa in the 60s and 70s are bucolic red due to preservatives and food coloring. My grandmother seasoned her longganisa under the sun to bath in its own oil. To date with a conscious consumer and the modern marvel of refrigerator and freezer extending the life of longganisa with half of the preservatives used before. How did you find the version with the sugar in comparison with the first version? I remember longganisa as being quite sweet and sticky when cooked, so was wondering how it tasted. Did you use white granulated or brown? 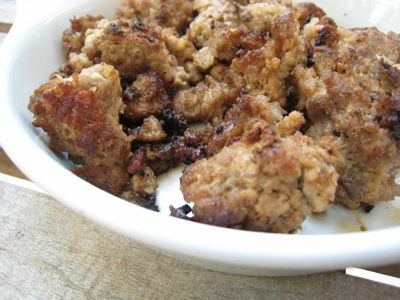 I also remember a kind of naked longganisa from my childhood that didn’t use casings, but parchment paper to roll it into a sausage, then you would take the parchment paper off before frying. Anyone else remember those or am I out smoking oregano on this one? I have always included freshly ground pimiento or all spice in my longganisa mix and it gives it that distinctive taste.I have a friend who includes pineapple juice and it taste bloody good,too! I’ll definitely try yours MM,it looks good! Longganisas are delicious!! The Vigan and Lukban varieties are my favorites. The sweet ones are fine but I always go for the garlic overload sort. But the ones that come from Isabela, for me, are tops. Unfortunately, I haven’t found any in Metro Manila or anywhere else. I got a taste of it only because a colleague brought it from there–and that was ages ago. It is not exactly tender and perhaps, others would not really prefer it over the more known kinds. But it tasted like no other. As far as my tastebuds go, it is even better than the Lukban longganisa! Have you come across this MM? Is any of your other readers familiar with the Isabela Longganisa? Sometimes, I wonder if they used baboy ramo for this. Anyway, I remember one of your readers mentioning before about Tuguegarao longganisa. Would they, by any chance, be similar in taste?? One trick I hit upon that works perfectly for making skinless longganisa is to put the sausage mixture into a pastry/icing piping bag without the tip screwed on. A freezer bag with a corner cut off (to the diameter you want your sausage to have) works perfectly well as well, but is less environment-friendly. That way you can squeeze out the sausages to the length and size you want – they are very well packed and you don’t have to struggle with wrapping them tightly in wax paper. 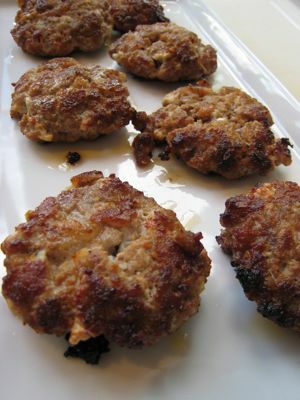 I just pop them into the fridge or freezer and results are great! I grew up making longganisa with my mom and back then we just chopped the meat by hand and feed it to the casing manually. It was hard but very much worth the effort! One thing I remember about making longganisa in casings is that we would air dry them on clothes line outside under the sun for a few hours which is ironic to Burnt Lumpia’s process of chilling everything in the refrigirator. What me and Mom made was always juicy and delicious although being in the US I don’t think I can replicate what we use to make. Look fantastic! I’m planning a sausage making session this weekend but have “lost” the details of where I bought casings last. I tried Werdenberg but they just laughed at me! Any ideas anyone? I’m in Makati, I seem to recall my last batch came from Paranaque somewhere….